I like to bake this cake in an 8-inch pan rather than a 9-inch since it's a thin cake. Once you mix the batter, spread it around the pan, then nestle the fruit on top. I used 10 strawberries, halved, and placed them cut-side down. Sprinkle about a tablespoon and a half of granulated sugar on top of the fruit. The last time I made it with raspberries, I used turbinado sugar and a bit less. My strawberries were not intensely sweet so I was more generous this time (my husband likes his fruit sweet). The cake batter, which takes only about 20 minutes to bake up, will rise and cover some (or most, as in my case) of the strawberries. The cake smells so good! Let it cool about 15 minutes before turning it out. Since the cake is moist, lining the bottom of the pan with a round of parchment paper is a good idea. This cake is good at room temperature and likewise while it's still a little warm. It's great if you can time it so that you dig in when the top is crusty and slightly crunchy. I love the golden sides and crust on this cake. Biting into this, you taste the softened berries, sweetness, a hint of lemon, without anything being overwhelming. Honestly, if you're going to bake something with fruit, this is a great one. The simple little cake will go fast and make you happy! On low speed, mix in the dry ingredients in 3 batches, alternating with the buttermilk, beginning and ending with the flour mixture. Mix until just combined and smooth. Scrape batter into the cake pan, spreading and smoothing out the top. Place fresh strawberries evenly around the top and sprinkle with the remaining 1 1/2 tablespoons of sugar. The best tea accompaniment! I want one too! Mine is gone and I just baked it yesterday. haha that's been me with asparagus this week! I'm hoarding it like crazy!! This cake sounds fantastic! And I happen to have a half used carton of buttermilk in the fridge right now. I just need to pick up some strawberries! Have a wonderful weekend Monica!! Enjoy the weekend...we're supposed to get snow this Sunday! Ugh! I can go crazy with berries on sale, but have to end up freezing some of it! I have tried buttermilk cakes before, they are moister than your run-of-the mill sponge, you can see it in the pictures! I just bought another box of strawberries! haha. Yes, buttermilk is like some magic ingredient. I have come to love it. This is a lovely fruit filled treat! I've been thinking about a raspberry breakfast cake made with buttermilk because my freezer is still full from last summer - I guess I haven't cleaned it out enough during the winter. I can't wait for local strawberries and will put this on my list of must-make recipes. Have a wonderful weekend Monica! Wow, this cake is stunning! I would love to try this with other berries, too :) So delicious! Definitely...I've done it with raspberries and that is nice, too. Hi Monica, I've been on a strawberry kick too, love, love this cake. Looks amazing!! Have a great week-end. I'm so with you on the strawberry and asparagus buying and eating spree. Your recipes have looked great! This sounds amazing – I’ve actually never tried a strawberry cake and thinking to use up the two strawberry boxes my husband bought. This is easy to make and eat. I hope you try it!! I've made that cake with raspberries before, and it's one of my favourites. Great idea to experiment with other kinds of fruit! Yes, I could just eat the cake by itself...so good, isn't it. What a beautiful cake! I love that you did a buttermilk approach to a cake (I love the taste!). I just got some strawberries on sale, so it might be cake time! I love buttermilk and I keep buying strawberries left and right these days, too! What kind of camera do you use? can you give me tips? Thank you very much for the measurements in grams. Can't wait to bake this cake. Have a Happy Easter ahead! Thanks and hope you have a wonder Easter planned as well! The cake looks so perfect! I have never baked with strawberries before, I only put them fresh on the cake. I have to try this. Still have to wait for a while, it takes another two months around here for the garden strawberries to ripen. I hear you...my husband loves fruity cakes, baked, warm, etc., whereas I'm the pop-in-in-my-mouth kind. I didn't use to even like berries, believe it or not. Glad to be a convert! It's strawberry season and I am so happy about it! This cake is right up my alley! Popping up from culinaryflavors.gr. Strawberries everywhere and at a very good price lately so I can't resist. Thanks, Katerina. I haven't been able to get enough fresh berries lately! I wish I had a slice of this cake to go with my coffee! I am eating half my weight in strawberries lately. : ) Not a problem, really! I miss the cake already. Oh Monica, this is such a pretty cake with all the strawberries in it...I love the way it turned out. Who can resist a berry sale! I am completely with you. Especially when the outcome is so delicious. Just love the way it looks. Neat, simple and so inviting! It really is very moist and delicate. Thanks! This is the recipe I need for when we go strawberry picking and come home with way too many!I also get carried away with berry sales at the supermarket! I am picturing eating this lovely simple cake all spring and summer. Oh this cake sounds so good! 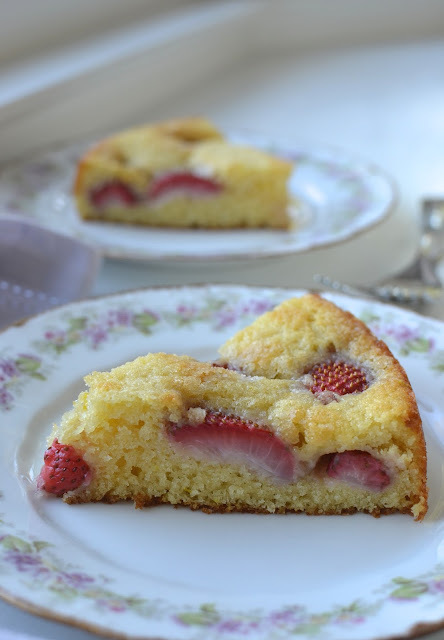 The golden crust and the strawberries just peaking through the top are just perfect. Definitely a keeper for summer cake baking! For sure...when and if I have extra fresh fruit that I don't eat all too quickly, I'm making this cake!